Amazon just announced that their Kindle e-reader will receive a price drop to $189, falling all the way from $259. It would be interesting to see just how this rather steep price drop will help boost the Kindle’s sales in wake of the iPad’s phenomenal release and sales performance figures thus far. 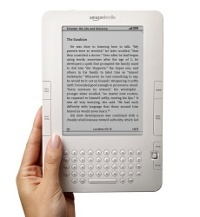 For those who have been living under a rock for the past few years, the Amazon Kindle is the 3G wireless portable reader which allows you to think of a book and be reading in 60 seconds, regardless of where you are – subject to availability of a Wi-Fi or 3G connection, of course. Best of all is, there are no monthly fees or annual contracts to worry about, and you can choose from more than 600,000 books. Woe to those who purchased the Kindle just a day earlier at the full $259 price, eh?